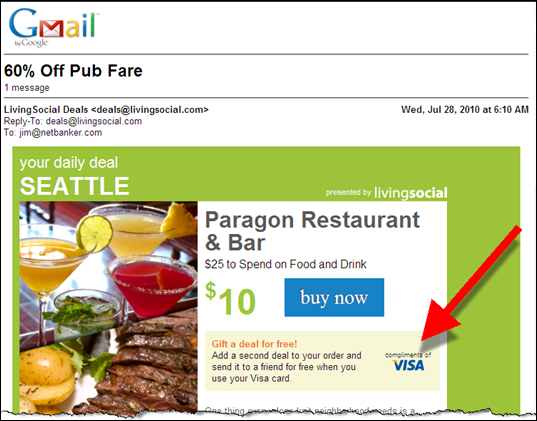 Flash Marketing: Can Groupon/LivingSocial Work for Banks and Credit Unions? The coffee shop where I do much of my writing held a huge sale yesterday. But you wouldn’t have known it from the sparse late-July mid-day crowd. The event took place entirely online through local deal-of-the-day marketer, Groupon. The day-long sale resulted in nearly 3,000 half-price $10 coupons being sold, a huge influx of customers for a 3-location coffee shop (see screenshot below). I’m working somewhere else tomorrow when the coupon buyers start coming in. 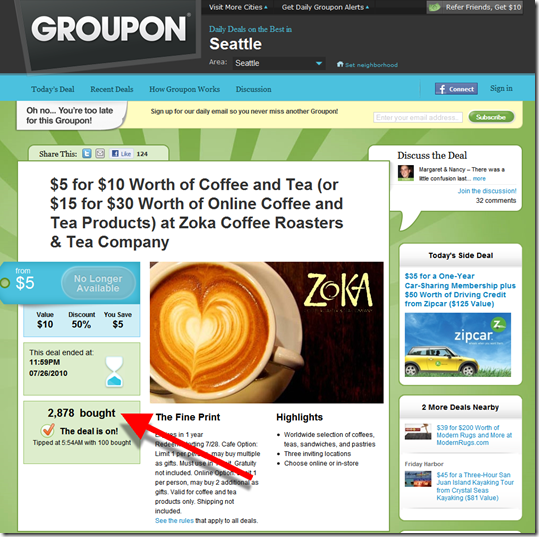 Groupon is the leader in the burgeoning field of localized flash marketing (aka social/group buying) having taken more than $170 million in VC funding to expand to more than 150 cities. The other major player is Living Social, which I’ve successfully used a few times to buy gifts. 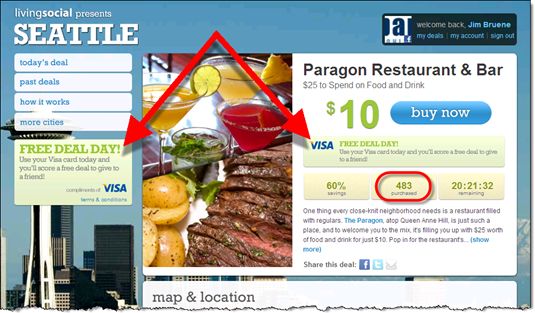 LivingSocial has raised $50 million and recently expanded to 52 cities. Both companies have nearly 5 million unique monthly U.S. visitors (see below). And with minimal barriers to entry, there are dozens of copycat sites in operation. There’s another sub-category in flash marketing, companies that specialize in certain types of merchandise. The pioneer here is the geeky and irreverent gadget and T-shirt marketer, Woot with 2.3 million monthly visitors. The site was scooped up by Amazon for $170 million last month. In women’s fashion, Gilt Groupe has a cult following and nearly 1 million monthly visitors. Flash marketing is not a new concept, and it’s not much different than the $299 laptop on the cover of the Best Buy circular. Savvy shoppers know to show up early at the store if they want to claim one of the few loss leaders in stock. Web-based flash marketers use email, Facebook and Twitter to inform potential customers of the latest deal. There is usually a time limit, typically a single day, and/or a limited number for sale. All the Groupon deals expire at midnight local time. Woot runs all its deals for 24 hours, or until they sell out, beginning at midnight Central Time. While I haven’t seen a financial product sold on Groupon or LivingSocial yet, there’s no reason it wouldn’t work. 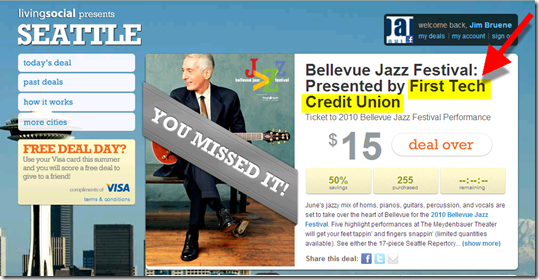 In a quick search, the only financial institution participant I found was First Tech Credit Union, a recent recipient of sponsorship recognition in a LivingSocial deal for half-off tickets to the 2010 Bellevue (WA) Jazz Festival (see second screenshot). But the promotions can be costly. The flash marketing companies typically take 50% of the sales price and require a deep discount, usually 50% or more off list prices. So retailers are getting as little as 25 cents on the dollar in the promotions (see note 1). Quantities can be limited to protect against too many takers. Or FIs could go the First Tech route and work with local restaurants, theatres, or nonprofits to sell a product bundle. For instance, a $20 dining certificate, 50% off on theatre tickets and a $10 Visa card for $20. 1. That assumes all coupons are redeemed. But typically a large portion, as much as 50%, go unredeemed. That means fewer new customers in the door, but it also helps limit the amount of discounts that must be honored. 2. The problem with many financial product offers is that not all customers will be approved. But you could offer refunds for anyone declined for a checking account. 3. For more info on selling online, see our Online Banking Report on Lead Generation. It’s been three years since I last went through my inbox to unsubscribe from the marketing and information lists I no longer read. At that time, I still used email to keep up on ecommerce and banking news. Now, that task has moved almost entirely to RSS, and I rarely read any broadcast email these days. 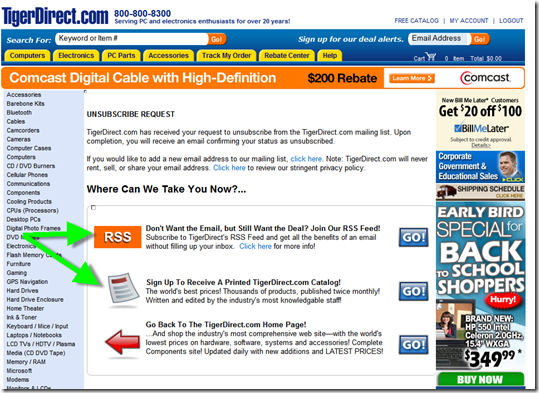 Put your branding on the unsubscribe page, don’t simply default to your email service provider page. Greet the customer by name and/or email address. 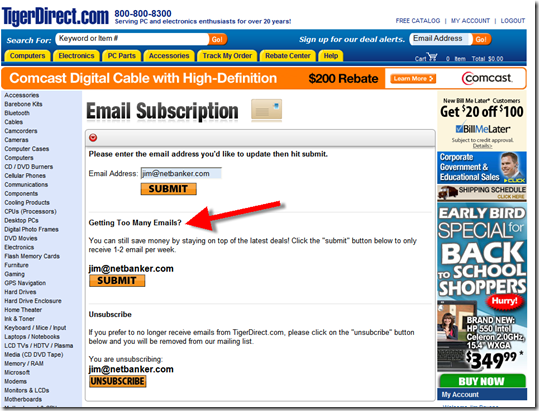 Provide customer testimonials on the value of the email subscription. 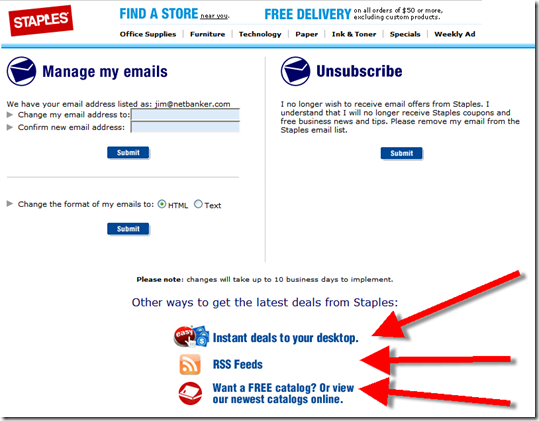 If applicable, explain that customers will still receive account-related email messages. Provide a feedback form so users can tell you why they are unsubscribing. Confirm the request online and provide links to other areas of your website. Send an email confirming that the unsubscribe process is complete. Email subscribers clicking on “unsubscribe” are first asked if they’d prefer to receive fewer emails. 1. 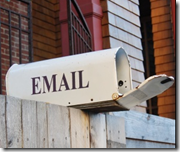 U.S. emailers must comply with CAN-SPAM regulations at all times. 2. Here’s a good presentation from Loren McDonald from Silverpop on the subject. 3. For more info on email marketing, see our Online Banking Report on Email Marketing in Financial Services (published June 2006). I was reading Currency Marketing (note 1) founder Tim McAlpine’s ten-part blog opus (here) on so-called Challenge Marketing, a mix of social media, sweepstakes and viral marketing. It’s great reading, especially if you are thinking of embarking on a new-media marketing campaign. In part 4, Tim created a list of media available for marketing messages. I started with his list, added to it, and rearranged the topics. Use this as a cheat sheet in your planning meetings to make sure you’ve covered all the bases. I know I’ve missed things, please add to the comments and I’ll update the list. 1. Tim McAlpine has achieved near-rock-star status in credit union social media circles as the mastermind of the hugely successful Young & Free campaign. Update: 18 March 2009, Tim posted a comparison of the latest Y&F campaign at South Carolina Federal Credit Union compared to the original Alberta one. The latest version is up in every category, a partnership with a local radio station is credited with part of the gain. 2. If you need examples from outside banking, here’s a 2-part wiki (here and here) created by social media guru Peter Kim with almost 1000 examples of social media efforts by various brands. With the financial crisis still in full swing, it's not easy to concentrate on the 2009 plan. But focus you must. You can bet that companies emerging from this mess as winners are working overtime right now, plotting how they will grab your market share next year. Yes, budgets will be down, but thanks to the Web and social media, there are more cost-effective opportunities than ever to get your message out. 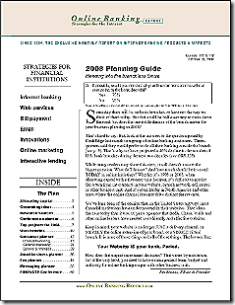 With that in mind, we offer the latest issue from Online Banking Report, our 14th annual Planning Guide for Online & Mobile Banking (see note 1). It includes 72 pages of ideas, tips and tools to help you generate new ideas, plans, and strategies for 2009 and beyond. Subscribers, Online Banking Report subscribers, may download it (here) free of charge. Others may purchase (here). 1. The Netbanker blog (established 2004) and Online Banking Report (established 1994), are written and published by the same company.